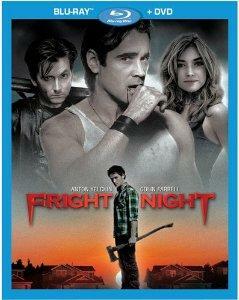 OVERVIEW: DreamWorks Pictures’ Fright Night, starring Colin Farrell, arrives on December 13, 2011 just in time to take a bite out of the holidays on Blu-ray 3D™, Blu-ray™, DVD, Digital and On-Demand. Inspired by the 1985 gothic horror cult classic and directed by Craig Gillespie (Lars and the Real Girl,Mr. Woodcock), all hell breaks loose when High School Senior Charley Brewster (Anton Yelchin) discovers his charming new neighbor Jerry (Farrell) is a Vampire preying on his neighborhood. Packed with un-rated bonus features, the Blu-ray release includes a fang-in-cheek mockumentary “Peter Vincent: Swim Inside My Mind,” a hilarious satirical look at David Tennant’s egocentric “rock star” anti-hero character, Peter Vincent; "The Official How to Make a Funny Vampire Movie Guide;” “Squid Man: Extended and Uncut;” “Frightful Facts & Terrifying Trivia;” "Deleted Scenes;” and a "Gag Reel.” Also included is the uncensored “No One Believes Me” music video directed by Fright Night’s director Craig Gillespie and performed by hip hop recording artist Kid Cudi. SYNOPSIS: Senior Charley Brewster (Anton Yelchin) finally has it all. He’s running with the cool kids and dating the hottest girl in high school (Imogen Poots). But all hell breaks loose when charming Jerry Dandridge (Colin Farrell) moves in next door. Charley thinks there’s something odd about him, although no one – including his mom (Toni Collette) – seems to notice. But after too many of his classmates vanish under bizarre circumstances, Charley comes to an unmistakable conclusion: Jerry is a vampire preying on his neighborhood! BLU-RAY: The film is presented in 1080P widescreen in a 1.78:1 aspect ration preserving its theatrical format. The picture is just flawless. Not only the picture looks great in this release, also the sound it is good, a English 7.1 DTS-HD Master Audio, and Spanish 5.1 Dolby Digital that provides a good complement to the picture. It also includes English and Spanish subtitles. Kid Cudi Music Video (uncensored version) - "No One Believes Me"